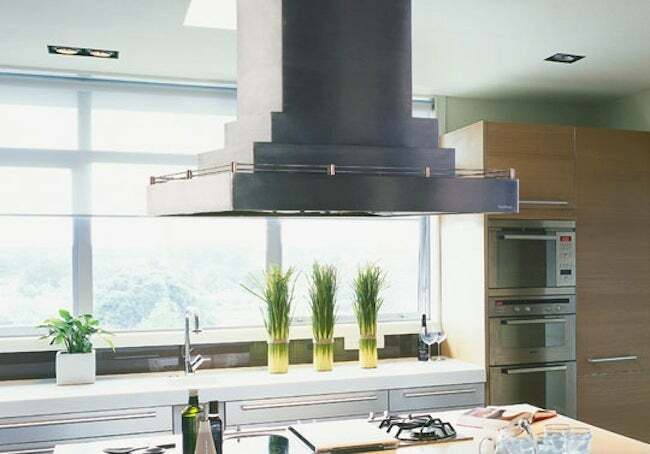 Find out how an effective exhaust hood is your best defense against indoor pollutants that result from the simple act of cooking. Today’s weather-tight homes are great for energy efficiency, but they’re not so good for indoor air quality. The greatest polluter in your home is probably your kitchen; the simple act of cooking releases contaminants such as nitrogen dioxide, carbon monoxide, and formaldehyde. Cooking also produces potentially harmful ultrafine particles which can enter the lungs, bloodstream, and other tissues. A study at Lawrence Berkeley National Laboratory in California discovered that 60 percent of homes with gas stoves that are used at least once a week can reach pollutant levels that exceed EPA outdoor air standards. Electric stoves are pollutant-producers, too, although to a lesser degree. An effective exhaust hood is your best defense. A group at Berkeley Lab tested seven hoods and found that their efficiency at capturing pollutants varied from 15 to 98 percent. They also found that the hoods didn’t necessarily meet their advertised airflow, measured in CFMs (cubic feet per minute), and that hoods did better at catching pollutants emitted by the back burners than the front. Take this study to heart. Make sure that your hood vents outside and doesn’t just recirculate air. It should claim an airflow of at least 200 CFM and extend as far as possible over the front burners—or alternatively, try to cook primarily on the back burners. Most important: Make it a habit to switch on the hood every time you use the burners or oven. Your lungs will thank you.